At a high level, the new 8 Gb DDR4-3200 chips consume 15% less power than the company's first-generation (1Xnm) DDR4-3200 devices. The process node bump means that their die size has also been reduced by around 20%, which will eventually help to drive down their costs. Initially, SK Hynix will use its 1Ynm technology to make memory chips aimed at servers and client PCs, but eventually the same tech will be applied to LPDDR memory for mobile devices. In addition to smaller die size and lower power consumption, SK Hynix’s newly developed 8 Gb DDR4-3200 chips feature two important enhancements: a 4-Phase Clocking scheme as well as the Sense Amplifier Control technology. The 4-Phase Clocking increases signal strength to maintain stability at high data transfer rates. Meanwhile, the SAC lowers possibility of data errors that may occur when transistor sizes shrink. The new DRAM devices from SK Hynix are the first memory chips to incorporate a quad-phase clocking scheme. While SK Hynix conservatively rates the new chips at DDR4-3200, the quad-phase clocking enhancement may potentially enable a higher overclocking potential, though this is something that has to be tested. 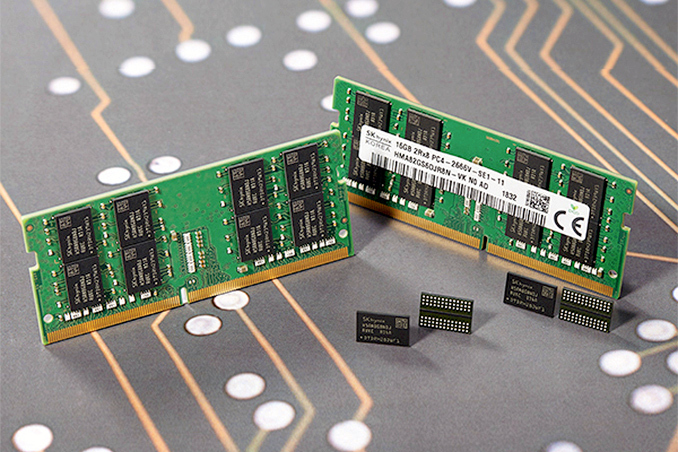 SK Hynix has not yet started mass production of DDR4 chips using its second-generation 10 nm-class fabrication technology. Keeping in mind that even the current-gen DDR4-3200 chips are listed as “sampling” at the company’s website, it is likely that the new chips will hit mass production in 2019. While DDR5 is starting to sample, no mass production SoC is on the horizon to leverage it in the short term. On the Intel side, it appears that the Ice Lake platform will remain DDR4 for main stream users in 2019 with the 2020 followup using the same platform. The server side will remain with LGA 3467 through Ice Lake-SP which looks to be a 2020 part as well. AMD has committed to their existing socket platforms through 2020. Thus existing platforms can enjoy Zen 3. AMD's new chiplet strategy does break off the memory controller from the CPU platform (I'm predicting that Zen3 will use the same IO hub as Rome in servers). This would let AMD transition sockets relatively quickly as the CPU side of things is already done. Still I would not expect a new socket from them until 2020 at the earliest. To add on to your point re: AMD's Zen architecture and DDR longevity: Without knowing the exact way that Rome works, it seems very likely that AMD will make multiple IO hubs. My bet is consumer-facing parts will have a "cut down" version of the IO hub.